Flu Survival Guide — Kristy M. Ayala, M.A. January 11, 2018 / Kristy M. Ayala, M.A. I hope this finds you healthy, happy, and enjoying your new year in the way that’s best for you. However, if you’ve started your new year with this flu that seems to be everywhere, trust me you’re not alone. In fact I’m writing to you from under my covers as I’m finally starting to feel a bit better after being down for the count with this thing since December 26th. 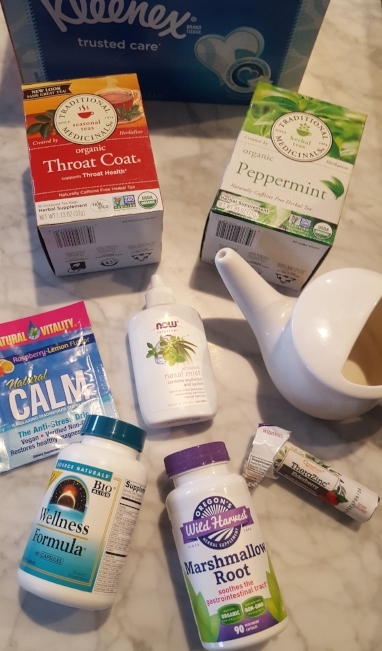 I thought that I would share what has helped me muddle through this crazy flu in case you know someone who has it or in case you have it or get it. The first thing that became a big problem for me was that I completely underestimated the intensity of this thing and I treated it like a regular cold or bug….big mistake. So even if you are perfectly healthy, you may want to increase any immune boosters that you like to use and make your home a nice and clean space to help keep this at bay. All the regular stuff that you do to help your body move out the yuck factor like drinking lots of water, hot herbal teas, and rest apply here however… they all need to be super sized. I had all of the above and one of the things that surprised me the most was how freezing cold I was and that I needed to sleep nearly around the clock. I was wearing a snow hat in the house with the heater on plus lots of layers and blankets….yeah, not cute and not fun at all. Once I felt warm, it helped me to rest and sleep so finding your own personal warmth barometer can make a big difference in helping your body feel supported. The other big thing was surrendering to the fact that my body was going to be down for a while and that trying to “get things done” was completely futile. Try not to push against your body; it will just make you more exhausted and possibly extend your self care time. I’ve included some things below that helped me feel better during this crazy flu, I hope that some of these might help you or a loved one too. I also included a super easy gentle soup recipe that helped me sooo much. If a loved one asks if you need anything from the store, say yes. I kept saying no to offers from people because I thought I had everything I needed but once I finally said yes I realized I didn’t have what I needed. If you don’t have any family or friends who live near you, you can probably get almost everything from Amazon. I wish I would’ve thought of that weeks ago….but the brain fog is real. Even if you don’t usually buy the lotion tissue, your face and nose will thank you. This will help to soothe your sinuses, skin, and help you to breathe easier. Helps with sore throat plus has herbs to help increase your immune system. This is really soothing, helped with the body aches and tastes very gentle. I was afraid that it would taste bitter or leave a bad after taste in my mouth but it didn’t. This has lots of vitamins and herbs to help your body increase immunity. If you experience the intense stomach pain like I did, you may want to try this. It lifted the stomach pains away gently and kept them away so that I could sleep. This is a hydrating mist to help with sinus pressure and post nasal drip. I usually don’t like to use these because they burn, create medicine head, and taste awful but this one is great and didn’t do any of those things to me. It feels really gentle and has no taste, yay! These help with sore throat too but they also have elderberry in them which helps to increase immunity. They taste good and don’t make your whole mouth feel numb like some of the other lozenges out there. They are a bit chalky though because they are compressed and not hard like a candy. Lots and lots of water and if you can handle Apple Cider Vinegar, adding a Tablespoon into your water bottle can help to reduce inflammation in your body and help increase immunity. A warm bath with Epsom salt and Baking Soda can help to ease the body aches and body pain while also increasing your magnesium, supporting your body in fighting off the ick. If you are experiencing cold sweats, the Baking Soda can help to reduce that experience for you. Use them because anything that can help move out the aches and pains will help you feel so much better. Overall, just rest and try to take it really easy on yourself; let people help you if possible and don’t try to force yourself to be better before you really are better.